Want to Take an Electric Roadtrip? Owners of electric cars will now have a charging station down the M6 motorway from Cumbria to Liverpool. This will make the ability to utilize electric cars a reality at last. The installed electric car charging point is the tenth in a series of service stations across the UK by the Ecotricity green energy company. 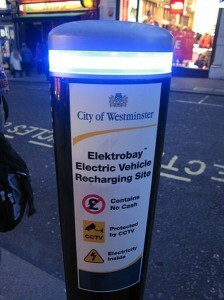 Ecotricity is responsible for the installation of 10 charging stations. The charging stations are points that are powered with solar and wind energy. Until this recent addition of a charging station on the M6, electric car drivers have had to worry about running out of power along their routes from Cumbria to Manchester or Liverpool. Ecotricity will be installing another 14 charging stations in locations at motorway services around the landscape; it is what will be known as the Ecotricity Electric Highway. The long term goal is to have all 27 Welcome Break motorway services with installed charging stations, these points are to be completed across Britain in 18 month’s time. This is a broad and yet attainable goal for their company, but with the UK government behind them all the way it seems to becoming a reality. There may be nothing that can stop this dynamo of a company. What they are doing is what everyone else hoped to be doing years down the road, but somehow they have made the paradigm shift and taken the big risk that seems to be quickly paying off. All that is left to do is build a stable and growth sustainable market of new drivers, but that is probably the easiest part of the overall job. Electric cars using rapid recharge points, it takes about 20 minutes to top-up the vehicle or two hours to fully recharge. This is with the powerful 32Amp with 7-pinsocket connections. For slower vehicles having 13Amp power supplies, the full recharge will require an overnight stay. There are only about 2000 electric cars on the UK roads currently. Ecotricity is hoping to change that with the construction of the Electric Highway. They want to create a new infrastructure leading to an electric car revolution throughout the United Kingdom. With oil prices through the ceiling, they see this as the perfect opportunity to launch their innovative green friendly market. Ecotricity claims that they could meet the driving needs of the UK, which travels about 250 billion miles per year, with the power produced by 12,000 windmills with the technology currently available. Companies around the globe, especially from the United States and Japan, have been observing Ecotricity with keen interest. There is sure to be somewhat of a business paradigm to be built off the model that they are engineering for the UK. As it is yet, for now their goals are focused on the needs and further development of the United Kingdom infrastructure. Ecotricity is the leading green energy company in Britain and was founded in 1996. It is a not for dividend company, meaning it has no shareholders and no board to answer to. It currently powers 50 thousand businesses and homes in the United Kingdom. It has 53 windmills and is the largest investor in green energy sources in the UK and the only energy supplier supported by Oxam and the Soil Association. Ecotricity is likely to be a growing force in the next century of green energy and economic environmentalism globally. This is an amazing step forward for energy production in the modern world. This could be a revolution that changes the way the markets look at the economics of energy efficiency on a global scale. Ecotricity in only concerned about the needs of the UK for the time being but there is no telling what the future could hold for such a progressive and forward thinking company. So it is Ecotricity with the cards. Jarod Matthews is a contributor for cartaxbands.org, where you can find information about Car Tax Bands as well as the forms needed to file your car tax online.